The Vietnam war was fought in a setting quite alien to US troops and military command: thick tropical jungle. To combat the use of those jungles as a hiding place for North Vietnamese forces, the US employed mass spraying of herbicides to defoliate the forest and kill the enemy’s crops. 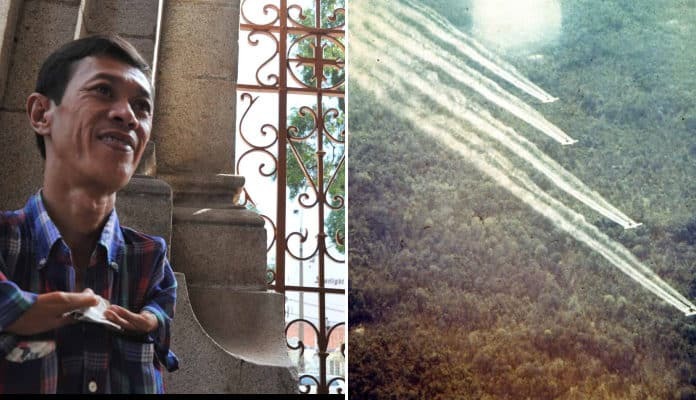 Throughout the conflict, over 4 million acres in Vietnam, Laos, and Cambodia were sprayed with herbicide, which was applied by airplane, helicopter, boat, and by hand. In addition to enemy locations, the perimeters of US military installations were also kept neat and deforested by the same application. At the time, it was believed that the combination of two herbicides being used was utterly harmless to humans, so nobody wore protective equipment when using the mixture; and nobody thought about the safety of the Vietnamese, Laos, and Cambodian populations being exposed to it. The two herbicides, 2,4,5-T and 2,4-D, are famously known when combined as Agent Orange. When blended, these potent herbicides create a highly toxic dioxin compound known as 2,3,7,8-Tetrachlorodibenzo-p-dioxin, or TCDD. It was this very compound that was used against Ukrainian President Viktor Yushchenko in an attempted assassination by poisoning in 2004. A U.S. Army Huey helicopter spraying herbicides known as Agent Orange over agricultural land during the Vietnam War. U.S. Army Operations in Vietnam R.W. Trewyn, Ph.D. / Huey Defoliation National Archives / Wikimedia Commons / Public Domain. In current research, TCDD is universally recognized as a potent toxin to the human body. Developmental toxicity, meaning harmful effect on fetal development, is considered the most severe result of exposure. TCDD is also considered as a carcinogen or cancer-causing agent. It was classified as a group 1 carcinogen by the International Agency for Research on Cancer in 1997, which means there is sufficient evidence of cancer being caused by exposure to the agent. Other group 1 agents include famed carcinogens asbestos and radium. A map showing locations of U.S. Army aerial herbicide spray missions in South Vietnam taking place from 1965 to 1971. U.S. Department of the Army / Wikimedia Commons / Public Domain. TCDD acts via a receptor found in all cells, the aryl hydrocarbon receptor. This receptor is a transcription factor, which means it is involved in the expression of genes. It is the role in gene expression that causes TCDD to have a toxic effect on embryonic and fetal development. In rats, high exposure to TCDD causes an increase or decrease in the expression of hundreds of various genes. While there is some debate in the body of research, TCDD is generally considered both mutagenic and genotoxic, or a compound with the ability to damage the genes in an organism and within the organism’s cells. While also controversial in scientific research, there is documented evidence of teratogenic, or congenital disabilities, effects of TCDD. The evidence of birth defects in those exposed to TCDD in utero is well documented; however, the causal impact of TCDD being responsible for the effects is less certain due to poor methodology, which is at least in part due to the politicized nature of the topic. The US Government has long been loathed to acknowledge any harm caused by Agent Orange, as it could result in enormous costs for compensation of loss of life and other health effects. US Court rulings allowed payment to disabled veterans harmed by Agent Orange, but intentionally omitted any liability for disabled children born to veterans affected by exposure to Agent Orange.